On International Migrants Day, WHO/Europe recognizes and celebrates the important role that migrants play, and the great economic and social benefits arising from migration. The 2030 Agenda for Sustainable Development also recognizes the positive contribution of migrants. The number of international migrants worldwide reached 244 million in 2015, according to the United Nations Department of Economic and Social Affairs. In the WHO European Region alone, there are more than 87 million international migrants, accounting for approximately 9.6% of the total population. However, recent large population movements, including in Europe, have given rise to political, social and economic challenges, as well as health system pressures. Public health and health systems must adjust to the needs of migrants and refugees in vulnerable situations. A multisectoral approach to ensuring their health and well-being is essential to achieving the Sustainable Development Goals (SDGs) related to poverty, health security and inequalities. The overarching aim of the SDGs, “leave no one behind”, also speaks to the need to reach migrant and refugee populations specifically – a group often left behind. A particularly important issue is that of unaccompanied minors in the Region. One example of how countries are embracing the commitment of the SDGs and working to ensure the health and well-being of this vulnerable group comes from Levanger Municipality in Norway. Levanger, a member of the Norwegian national network of the WHO European Healthy Cities Network, has undertaken an initiative that works to promote integration in the community and equal opportunities. It recognizes that ensuring social inclusion and cohesion is beneficial for the mental and physical well-being of migrants themselves, and also leads to better outcomes for society as a whole. 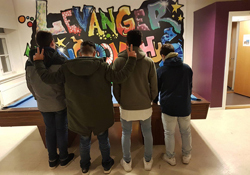 Hassan, Lars, Amir and Thomas are 4 teenage boys who owe their firm friendship to the Together initiative that connects unaccompanied minors in Levanger with Norwegian young people of the same age. These youth are put together in groups to work on a shared project on the theme of cultivation – both of plants and of interests, such as singing or bowling. Forging friendships in this way helps the young refugees feel included in their new communities. The Norwegian SOS Children’s Villages originally developed Together in collaboration with 3 municipalities. The initiative has now spread to 15 municipalities across the country. WHO/Europe is committed to protecting the health and well-being of all migrants and refugees, promoting social inclusion, and ensuring no one is left behind. As such, it is taking collaborative, multisectoral action on refugee and migrant health within the Region. Below are some of WHO/Europe’s recent activities to support a focused response to protecting and improving the health of migrants. On International Migrants Day, WHO/Europe is launching the Knowledge Hub, a new website on health and migration. A joint effort of WHO/Europe, the European Commission, the Ministry of Health of Italy and the Regional Health Council of Sicily, the Knowledge Hub offers a powerful tool to support the work of policy-makers and practitioners who deal with the health aspects of migration. It endeavours to build upon available evidence and disseminate it, promote dialogue and critical thinking on this complex and interdisciplinary field, and develop expertise and competency on the public health aspects of migration. To commemorate International Migrants Day, WHO/Europe also organized an exhibition of photographer Mohamed Keita’s work at UN City in Copenhagen, Denmark. The series and its photographer exemplify the resilient spirit of migrant people, and highlight the reality of a community benefitting from migrants’ contributions once its members have welcomed and engaged them. In 2018, WHO/Europe will publish the first-ever European Refugee and Migrant Health Report. This report aims to address the critical shortage of collated, scientifically valid and comprehensive information on the health of refugees and migrants in the Region. It will provide further evidence to promote migrant-friendly health systems.